As dogs start to age, their bodies begin lose to vigor. Their joints and cartilage are worn down due to constant use, similar to humans. Arthritis, hip dysplasia, and other joint problem often plague dogs in their golden years. Joint problems can be a huge burden to pets and can detrimentally affect their quality of life. Worse, watching your dog suffer from increasingly incapacitating joint pain, either due to old age or an accident, can be a profoundly heartbreaking experience. And, given that you love your dog, you will often try to address such joint issues with a proper diet and exercise. However, this does not only work. What do you do when faced with the distress of knowing that every step or movement of your dog is painful and uncomfortable? Fortunately, with Nutramax Dasuquin for dogs, you can breathe a sigh of relief because it will help you remedy your dog’s joint problem. Nutramax Dasuquin for dogs is an extremely effective supplement for promoting joint health in dogs. It’s ingredients such as glucosamine and chondroitin are used as vital components in the body’s natural process for reinforcing and reconstructing joint ligaments and cartilage. Nutramax Dasuquin is the ultimate answer that will guarantee that your dog receives all the care and nutrition needed to maintain a healthy and active lifestyle through the golden years. Below is an insightful review about this remarkable supplement for dogs. View Nutramax Dasuquin for Dogs on Amazon.com! Nutramax Dasuquin for dogs is a dual synergistic formula that is used as a supplement to promote healthy joints in dogs. The supplement is manufactured by Nutramax, which is an American company based in South Caroline, USA. Nutramax has combined over ten years of clinical use and thorough research on joint health supplement to come up with Dasuquin for dogs. Apart from Dasuquin, they manufacture several other types of supplements for dogs and cats. Some of the active ingredients in Dasuquin for dogs supplement include NMX1000 ASU, Decaffeinated tea with Cosequin’s FCHG49 glucosamine hydrochloride, and TRH123 low molecular weight Chondroitin sulfate. ASU stands for avocado/soybean unsaponifiable. These ingredients are expertly combined to offer one of the most comprehensive joint management formula available for dogs. This combination of ingredients works effectively in a way that has been clinically proven. As a dual synergistic formula, Nutramax Dasuquin efficaciously uses glucosamine hydrochloride and low molecular weight chondroitin sulfate to stimulate cartilage matrix production. It is worth mentioning that Nutramax Dasuquin is one of the few products that use all natural ingredients in their formula. Due to this, side effects are minimal if any., Nutramax Dasuquin comes in the form of tablets that are chewable and tasty. You dog might even be forgiven to think that the tablets are treats. How Does Nutramax Dasuquin Work? In order to improve its effectiveness, Nutramax Dasuquin goes beyond what standard glucosamine supplements are made of, and, what they offer. Nutramax Dasuquin contains ASU, which, as mentioned earlier, contains avocado/soybean unsaponifiable. The ASU is fortified with great tea, and has been found to improve both joint functions as well as the comfort level of dogs with arthritis and other joint problems. Several studies have confirmed that ASU can lower the production of various compounds that are involved in breaking down cartilage in dogs. Nutramax Dasuquin also contains Methylsulfonylmethane (MSM). In fact, its label is inscribed “Dasuquin with MSM.”MSM is crucial because it is a vital aid in controlling pain and inflammation associated with canine arthritis. Additionally, MSM also assists in the production of collagen and other connective tissues for healthy joints. The potency and effectiveness of Nutramax Dasuquin will ensure that your older pet keeps playing like a puppy with ideal joint health. What are the Benefits of Nutramax Dasuquin? Various benefits have been associated with Dasuquin, including the ability to relieve the pain and discomfort that tows along with arthritis. The benefits of Dasuquin are not superficial. Research and scientific evidence have shown that the two primary ingredients – glucosamine and chondroitin- can remedy osteoarthritic pain by addressing the root cause. With additional ingredients like ASU and MSM, the efficacy of Dasuquin is not only reinforced but also indisputable. Many people that have given Dasuquin to their dogs have said that they noticed positive responses in just a matter of weeks. However, given that different dogs and their differences can cause a different reaction to the same ingredients, not all dogs will respond the same way to this supplement. Some dogs might take longer to respond to the effectiveness of the supplements depending on their weight or the seriousness of the joint problem. Dasuquin is evidently ideal for dogs that have a problem with taking regular chewable tablets. Its tablets are soft, chewable, and tasty. The softness of the tablets ensures that your dog can easily chew up and swallow them. This gives the Dasuquin the benefit of easy administering. Due to the scientific backing on the potency of the ingredients of the Dasuquin, it would suffice to say that it is an efficient supplement. In fact, almost all dog owners that have administered the supplement to their dogs have reported positive effects of the products. As mentioned earlier, Dasuquin tablets are chewable, soft, and tasty. These attributes are convenient because you can simply mix the tablets with your dog’s food. Dasuquin has been created after years of experimentation and research. As a result, its potency has been clinically tried and proven. It is no secret; some supplements are laced with chemicals that might cause adverse effects to your pet. However, with the Dasuquin, you don’t have to worry about any adverse side effects because it is made from quality and natural material. The only side effect that has been linked to Dasuquin is that it might cause mild gastrointestinal upset such as the kind that occurs when switching your dog to a new diet. 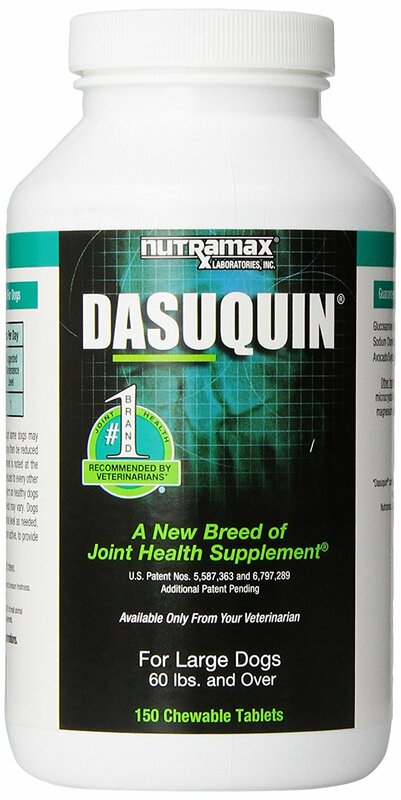 Dasuquin for dogs has been proven to provide a way to promote healthy joint function. Even though it cannot perform miracles, it will produce noticeable effects on the comfort of your dog if it has joint problems.